I’ve quickly mentioned containers here. Now I want to get back to this concept with regards to load execution delays, commonly referred as “Think Time” and “Pace Time”. Same as typical user makes pauses while working with an application, the load script needs to delay execution for periods of time in order to generate realistic load. 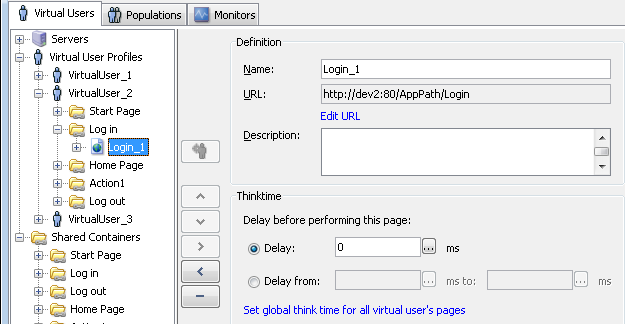 Delays before sending data are usually called “Think Time”, and defined as a page property – see screenshot below. Delay can be hard-coded, parameterized, or randomized within defined range. There are also operations that are supposed to run for a period of time, which delays posting of the next request. 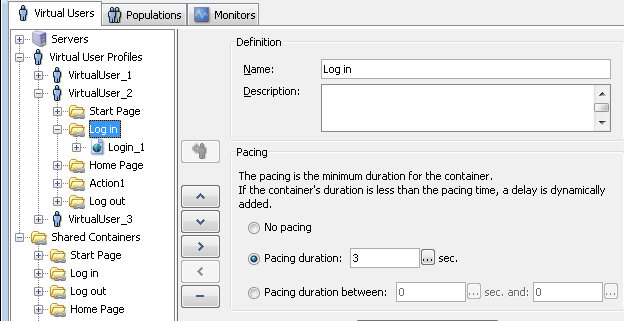 In order to control this behavior, we can define pacing parameter for the container – see screenshot below. Again, these delays can be hard-coded, parameterized, or randomized within defined range.